Since I had a bit of bachelor time this evening after completing my PBEM files I decided to start up a FCRS campaign and thought I would share with you all. I'll be in charge of the 3rd Brigade of the 2nd Armored Division. The other brigades of the 2nd Armored are in the Fulda Gap but we are stationed on the North German Plain. The war kicked off with the Soviets attacking through the Fulda Gap and just about the time NATO was about to shift us south the Soviets finally unleashed their attack here. We've deployed east of Bremen with orders to hold the Soviets away from this vital port. Here is the beginning map with our set up areas in purple. I have the option to deploy my troops as I see fit. Well the Soviets started their advance and we successfully ambushed them on the southern route. All the little fire and smoke symbols you see are Soviet wrecks. These wrecks amounted to 2 recon elements, 17 tanks, 1 mech element, and 3 HQ elements. The Soviets did pummel one platoon with direct fire and lots of artillery and we lost most of one platoon. Time to pull these folks back if we can disengage and get further into the city for better cover for us and worse for Soviet armor. I've well inside the Soviet's decision loop with a decision time of 17 minutes to their 29 and my projected for next turn is 15 minutes. Time to get into position. Well a wrench in the plans as Soviet radio jamming has run me out of orders so not everyone is going to get the word to move out. More when I get a chance to sit down to it again. I've played an 1 hour and 25 minutes of elapsed game time now. My infantry company that I had in that town south of Bucholz has been all but wiped out with only one element of the HQ platoon left. I did get some Paladin's as reinforcements and used one battery to drop FASCAM (the yellow circle) on the road leading out of that town. Hope it's a bit of surprise for those Commie bastards. I've received one tank company, some HQ elements, two batteries of Paladins (worth their weight in gold), and another couple of AD elements. For the loss of that infantry company and a few squads from another platoon and the one recon element we've killed the following; 13 recon, 29 tanks, 18 APC, 3 infantry platoons, 10 HQ's, 1 AD, and 4 transports. I'll take that loss ratio all day long. My infantry/Bradley's are doing great damage with their TOW's and the Paladin's are hammering any Soviet HQ that spends too much time on the radio without moving. No screenshots this time as I've decided to let the action unfold bit more. The Soviets have taken advantage of my screw up and are coming across the one bridge I didn't get destroyed in Bucholz. I've been using FASCAM and ICM on the bridge approaches and my infantry are killing tanks in droves before succumbing but those Commie bastards are just like Ron Jeremy, they just keep coming! Holding my own elsewhere as we've shot up the mechanized infantry that were approaching along the northern highway and the Soviets seem to respect the FASCAM I laid on the highway in the south. They've sent a few tank units through them but have had losses and the rest seem content to sit back and take pot shots at the cavalry troop I have on the hill just to the north. I can expect another infantry company in 36 minutes but no more armor for another 56 minutes. I'm concerned about that southern highway as I have next to nothing there if they get some intestinal fortitude to run those mines and make a hard push that way. I'm hoping that their losses there will hold them up for a bit. Fighting has been vicious in Bucholz. Lost the better part of two infantry companies but we have slowed the Soviets down quite a bit and they still haven't been able to exit the town. Here is the screenshot. My armor has been able to take of his forces entering from the north and from the west along the northern east-west highway. Received another infantry company and they are going to secure the southernmost highway and the bridge. Hopefully it will be enough. Armor is set up in the center awaiting the Soviets to come into the open. More reinforcements in the way of artillery set to arrive in another decision cycle or two. Right now my decision cycle is down to 13 minutes and theirs is at 41 minutes. Means I can give orders 3 times before the Soviets can once which should give me a distinct advantage. Have to be careful though as they were able to track my Brigade HQ last turn and shell it with the loss of one element. Last update for the night. Not sure when I'll get back to it but here is where we stand now. This is the screenshot of the current situation from Bucholz north. Nothing moving south of Bucholz so we leave that be for now. My armor on the north side has been absolutely chewing up the Soviets when they try and advance down that northern highway. We'll be standing pat there. In the center we have another Abrams unit moving up on that hill you see there to give me two tank platoons there. Hopefully this and the infantry will be enough to discourage any rapid charges by Soviet units coming out of Bucholz. Need to slow them down for another 35 minutes as then I'll have another tank company making appearance with another one to arrive shortly after that. So far I'm feeling okay about my situation though the sacrifice of so much infantry for time my haunt in the next battle when this one is done. I've been leaving the artillery "on call" and letting the AI staff call in fire but in three or four cycles I'll get a fire control unit and then we might see about firing outside the defensive needs. Hope you guys are enjoying this. Helps keep me focused and my interest up in playing it out if I do this. Thanks for posting! Looks like a tough fight. Finally back to the Northern German Plain with the Hell on Wheels. The road from Bucholz to Sprotze has turned into a Soviet junkyard of wrecked vehicles as my dug infantry and Abrams on the hill top have wreaked havoc on the Soviet advance. Despite the odds I've still one lone Stinger unit in Bucholz itself. The Soviets fire a few shots as they drive by on their way to the front. Finally remembered that I can use smoke to my advantage but it really hasn't made a big difference to this point. I've finally received tank reinforcements so I feel comfortable in holding the Soviets and will try and retake the two VP hexes this side of the Steinbach from Bucholz. Soviet artillery has been exacting it's due though as they have been hitting hard. Currently I can issue orders every 13 minutes to 41 minutes to the Soviets. Wow, what a fight. Finally got the Soviets to 70% losses but I was sitting at 42% myself. Learned a thing or two that I hope will save my bacon in the next battle. 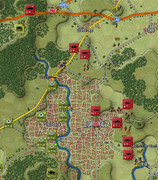 Only 4 more to go in this campaign but another one like this and we'll be looking to hold at the Rhine! The A-10's finally showed up and made the difference as those two planes made one run and took out the last 7 tanks and 2 AD units to get me to where I needed to be. It was scary though seeing just how many Soviet units were left.